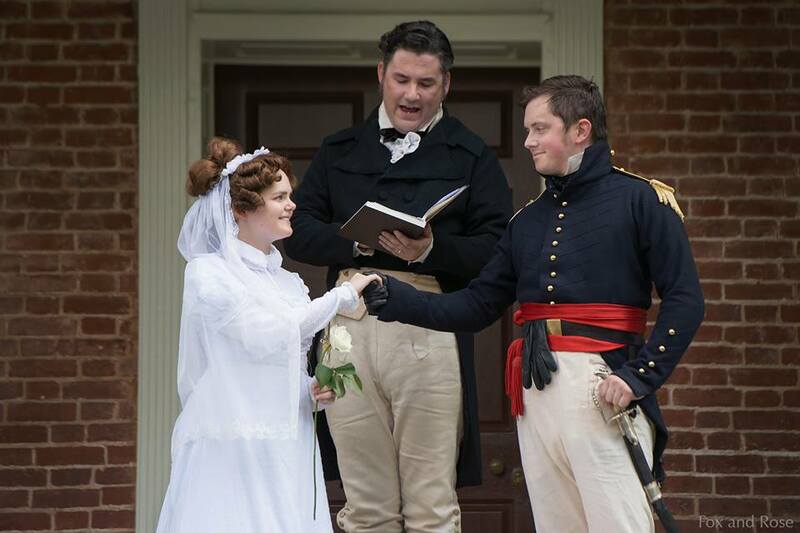 Presenting General and Mrs. Thomas Jesup! 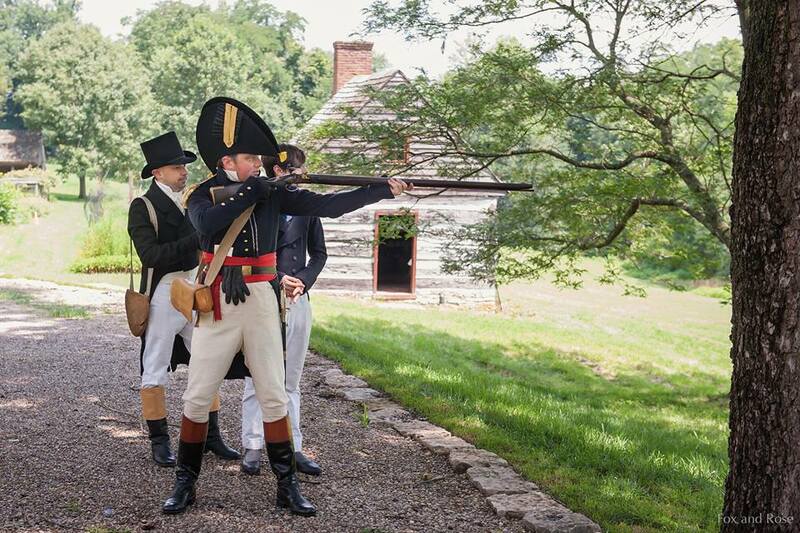 This is a recap of the event at Locust Grove. 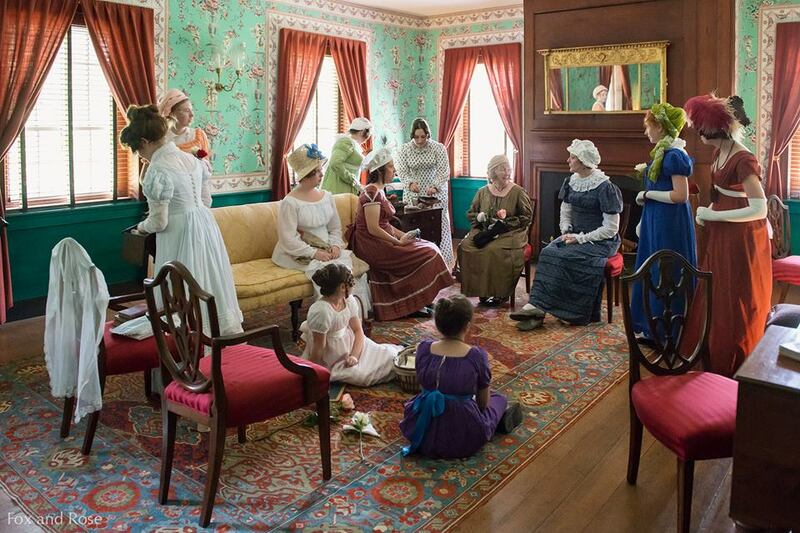 To read about the construction of my 1822 dress, you can start here. 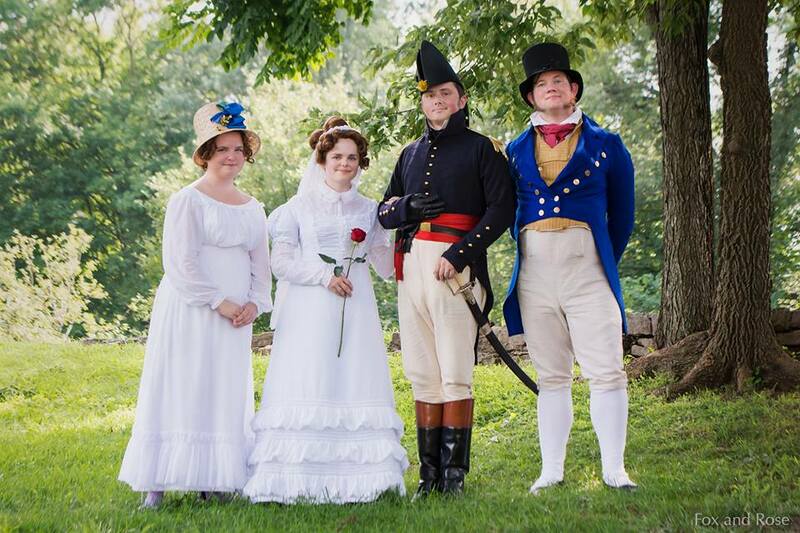 I know I’m a little late in showing off how the 1822 wedding turned out, but I hope you’ll forgive me when you hear about all the excitement! For Brandon and I the day started at 10, when we got to Locust Grove and started piling on the layers. Things were right down to the wire, and this was the first time Brandon had put on the finished jacket. Just for kicks, the event landed on a 97 degree day with a 106 degree heat index, so you can imagine how snug he was in thick, dark-colored wool. So glad that an amazing team of other CIs took on the task of creating a jacket from the 1821 regulations (a tricky period since it was a uniform that lasted only a few years, and there is very little documentation about it besides the regs themselves). So many blind-stitched buttonholes. Luckily I had help putting on shift, stays, petticoat, chemisette, dress and wig. I left the veil off until just before the ceremony–something needed to be a surprise! The wedding party gathered on the porch at 11 for a final rehearsal (our officiant had to step in at the last moment!). When that was over, Brandon got me to take a quick stroll through the garden before our busy day started. No matter how much stuff I wanted to do, or how many friends I wanted to chat with, he insisted, and by the grape arbor (where we took pictures together our very first time at Locust Grove), he told me he thought it would be weird for us to get fake married before we were really engaged. He dropped to a knee for only a moment (couldn’t risk those breeches getting dirty in the wet grass), but it was enough! 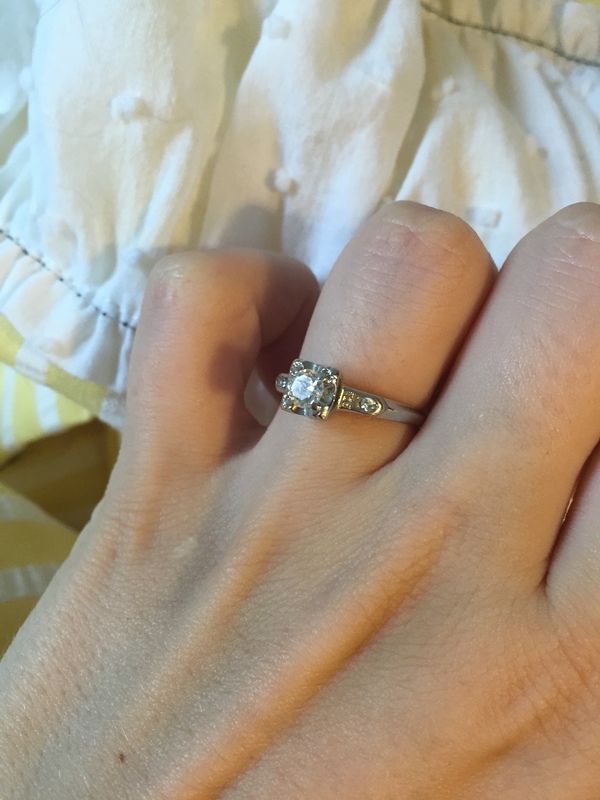 The ring belonged to Brandon’s grandmother, and couldn’t have been more perfect if I’d designed it myself! So, newly engaged, we scampered off to find our friends. We just about scared poor Brian (the program coordinator) to death when we told him to come with us to find everybody else. I don’t know what disasters were going through his mind in that moment, but we apologize for giving him a mini heart attack. Luckily, our fearless CI leader, Amy, had a couple bottles of champagne squirreled away, and we got a toast out of the way just as the event opened at noon. The men went off to carouse and shoot the fowler. The ladies started our day on the porch, where we could catch guests as they went into the house and talk up the wedding later in the day. We spent the afternoon wandering the grounds, chatting, and watching readings of Jane Austen’s early works, while the other CI ladies found married guests to ask for advice on my behalf. There was much giggling and blushing and grinning, all compounded by the excitement of a real engagement! The news was all around the event the moment it started. People we’d never seen before came up to congratulate us. Brandon had to rush to intercept his mom and brother when they arrived to make sure they heard it first from him instead of a stranger! This was my absolute favorite part of the day. It was a perfect moment in interpreting: alive and vibrant. 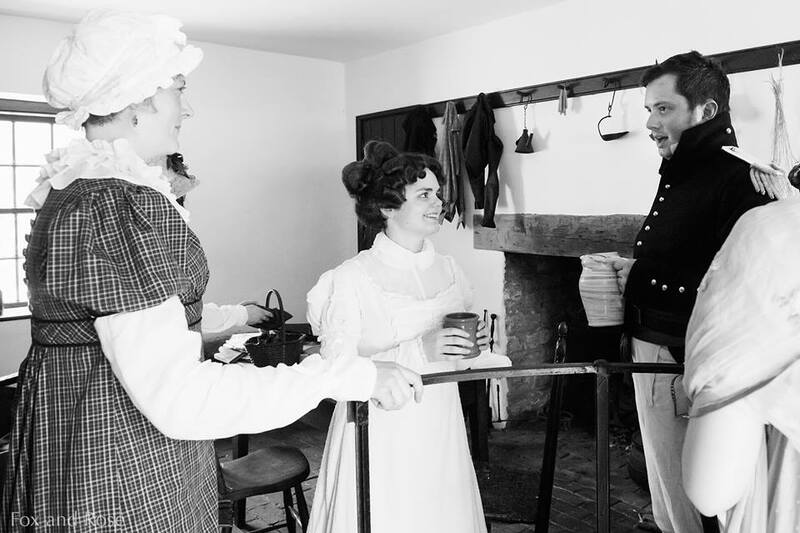 We were able to really bring the excitement of the day to the guests, and interact with people who came through the house on an intimate level. The moment I put my veil on and looked in the mirror sent a little shiver down my back as well. I couldn’t believe how fast the day flew by, and too soon it was time to leave this space and head to the main event! If you were there, you may have recognized the ceremony from the 1995 A&E Pride and Prejudice, but with all the extra fire-and-brimstone that they left out. My favorite bit is when he has to dedicate his body to me. Oddly enough, I did not have to do the same for him. After the ceremony, we retired to a lovely tent for cake, wine and more congratulations than we knew what to do with. Thanks to everyone who was there! The day couldn’t have been better. We meant to get back to the grape arbor and take some pictures for posterity, but never did get around to it. Luckily, the whole day was captured beautifully by Heather Hiner of Fox and Rose Photography. 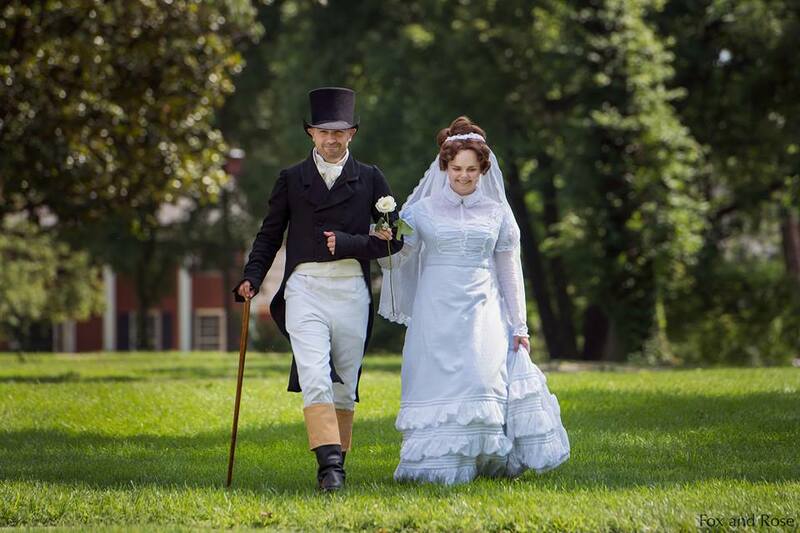 You can find more fun recaps of the event on the Locust Grove blog. Now we get to look forward to another day just as special next year! If you want to read about the making of this dress, you can begin here. Previous Post Miss Croghan’s Accessories, Part 2: Tambour Time!